Check out this site from the San Francisco Orchestra. Visit the Music Lab, where you can learn about the different music notes! This is a note pyramid. It is a helpful way to remember how music notes relate to each other. Notice how there are two half notes in a whole note, and then two quarter notes in a half note, and so on, as you travel down the pyramid! These are the different rests you will see in music. They tell you how many beats of silence there are. Each rest has the same number of beats as it's matching note. For example, a whole rest=4 beats, a half rest= 2 beats, and so on. 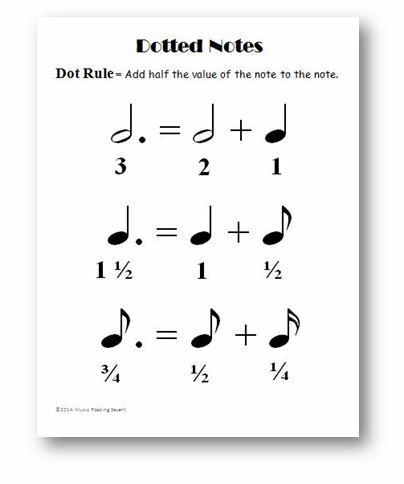 When there is a dot next to a note, it equals half of the value of the note that comes before it. So for a dotted half note, you add the number of beats in a half note (2) to half of that value (1). So a dotted half note =3 beats. Rhythm Hoopshot- Get an answer right and take a shot! Music Note Jeopardy- Play alone or on teams and earn points when you solve a problem correctly!